This Package Include:1x 25"Zebra,1x 22"Tiger,1x 22" Lion,1x 24"Monkey,1x 24"Giraffe,1x 24"Cow balloons, 12x 8.2" Green Leaves, 14x 12" Green Balloons, 21 Cupcake Topper, Good and Enough Decorations and Favors for Kids Boys Safari/Jungle or Tropic Luau Birthday Party. 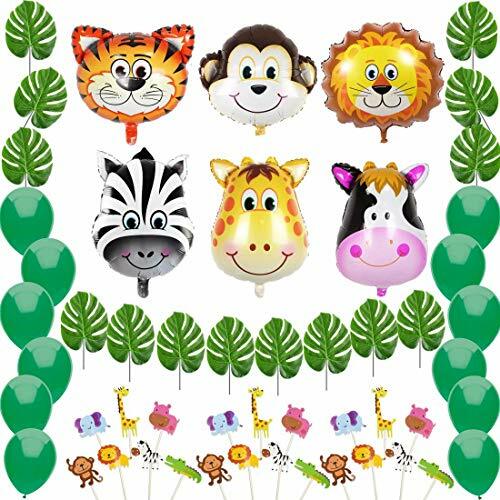 Big Size and vibrant colors of Jungle animal balloons.It made of thick quality aluminum foil,no leaks and auto-sealing,which can last for days when inflation. Big Size and vibrant colors will give your boys and girls a huge hit.Kids can have a blast playing with them during the party.It's also a adorable gift for them to take home. Please notice filling in normal air can not float. Filling only helium can float.12"Green Balloons Made With Premium Natural Latex and Safe to Be Used for Children. Functional Green palm leaves for added colors and decorations for your party. You can put them in glass vases for flower arrangements or stick in the banner or wall so that make your party more lively. Please notice If you want to hang,you need put holes with tools. 21 food grade Cupcake Toppers to decorate your cakes,Cupcake and muffins.Super cute animals are made out of a thick paper are secured onto the sticks, no worries about these things coming off. Pefect size for kids zoo animal themed, woodland animal themed, farm animal themed, safari jungle animal themed baby shower cake decor. Filling Animal balloons needs your carefulness and patience,if you are not so skillful,it may cause balloons split seam or holes.So We suggest filling up at local stores instead of filling by yourself before the party. If the balloons have leak or tiny holes in them and would not inflate,Please contact us for exchange. If you have any questions about this product by Marina's Day, contact us by completing and submitting the form below. If you are looking for a specif part number, please include it with your message.